He's seen too much and failed too many times. Now the homeless kids he mentors are dying and the only person who can help him find the killer is the woman who dug up his past to destroy him. Dev needs her help to solve the case, but he can’t trust her and he can't trust himself around her, because she's the sexiest, most intelligent woman he's ever met. 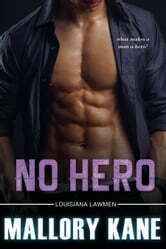 Journalist Reghan Connor knows there are no heroes, and she's out to prove it on the air for all of New Orleans. Her latest debunked hero is Detective Dev Gautier, who hates her for exposing his mistakes. Now Reghan has been given the key to the murders of Dev's homeless teens, but how can she convince him she's not setting him up for another fall? As they work together to solve the murders, Reghan learns that being a hero is complicated and loving a hero can be downright deadly.